Star Wars fans can now own their own R2-D2TM, the most famous astromech Droid of all time created by George Lucas. Now in the form of an inflatable remote control toy, take him on an adventure and create your own missions, join forces with other players, or battle against them! Use his multi-directional capabilities to escape enemies, or knock him over and watch him bounce back to dodge incoming attacks. Simply clip on the radio control drive unit to the base of the inflatable body, inflate with the included foot pump and then it's ready to run! Drive R2-D2TM indoors or outdoors with up to three playing together simultaneously! 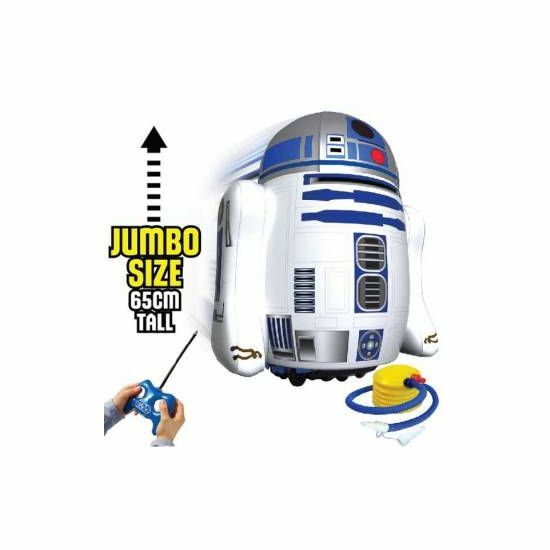 R2-D2TM features an innovative inflatable super durable body shell standing over 65cm in height. An easy to operate handset controls R2-D2 allow the Star Wars droid to move forward, back, left, and right plus perform stunts and 360-degree spins. A great piece of Star Wars merchandise that can be enjoyed by young and old. Check out the below video. Self-righting system means R2-D2 stands upright even when knocked over or driven down stairs! Easy controls and safety aerial on handset allows all ages to operate.